Eastern freshman Sidney Cook (14) hitting a two-run home run during the Lady Eagles sectional win over Green in Tuppers Plains. Cook was named to the D-4 southeast district first team for her efforts on the diamond this spring. 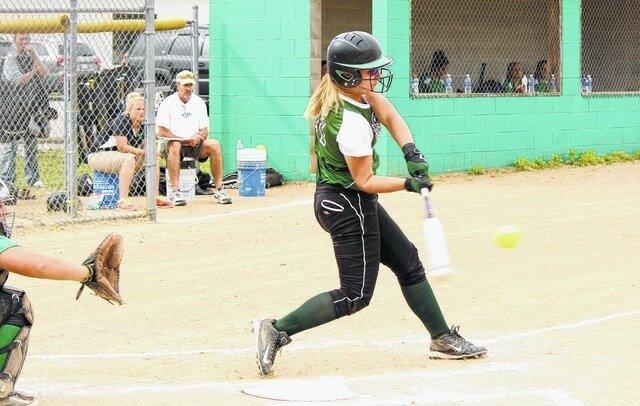 The Eastern, Southern and South Gallia softball teams combined for 11 spots on the 2015 All-Southeast Ohio District softball teams in Division IV, as voted on by coaches in the southeast portion of the Buckeye State. Eastern senior Grace Edwards, freshman Sidney Cook and Southern junior Ali Deem each earned a spot on the first team squad. Southern senior Cierra Turley, South Gallia senior Sara Bailey and Eastern sophomore Katlyn Barber were all selected to the second team, while Eastern sophomore Alia Hayes, South Gallia senior Shelby Sanders, junior Caitlyn Vanscoy, Southern senior Caitlyn Holter and freshman Paige VanMeter were D-4 honorable mentions. Kiley Sosby of Whiteoak was named the D-4 southeast district player of the year, while Jeff “Odie” Estep of Symmes Valley was selected as the D-4 coach of the year of the southeast district. Kiley Sosby, Whiteoak; Kaitlin Evans, Fairfield; Kaitlyn Payne, Symmes Valley; Brooke Pierron, Notre Dame; Mikayla Wyke, Eastern Pike; Cami Whitley, Portsmouth Clay; Jade Springs, North Adams; Sidney Cook, Eastern Meigs; Taylor Webb, Symmes Valley; Grace Edwards, Eastern Meigs; Mikalya Newland, Paint Valley; Ali Deem, Southern; Alana Heiss, Waterford; Morgan Johnson, Manchester; Mallorie Williams, Western Latham; Grace Larrick, Fairfield; Rachel Cooper, Portsmouth Clay; Maggie Whitman, Notre Dame. Nikki Kish, Trimble; Cierra Turley, Southern; Arica Melson, Fairfield; Jaycie Parr, Whiteoak; Sara Bailey, South Gallia; Tiara Hatfield, Symmes Valley; Kaelyn Hornikel, South Webster; Kaitlyn Spears, Trimble; Jayde Parr, Whiteoak; Katlyn Barber, Eastern Meigs; Shaylee Carson, Fairfield; Cecilia (CC) Shanks, Western Latham; Shay Brown, Sciotoville Community; Danielle Cline, Portsmouth Clay; Stephanie Brown, Symmes Valley; Brook Henley, Manchester; Tressa Carter, Portsmouth Clay; Kacy Craft, Eastern Pike. Jaelyn Dixon, Eastern Pike; Kylie Branch, North Adams; Jordyn Haggy, Western Latham; Kylie Tong, Western Latham; Jasomyn Frautschy, Sciotoville Community; Megan Carver, Sciotoville Community; Sydney Dingess, Sciotoville Community; Alia Hayes, Eastern Meigs; Shelby Sanders, South Gallia; Caitlyn Vanscoy, South Gallia; Madison Smith, Paint Valley; Ashleigh Harless, Whiteoak; Mikayla Belford, South Webster; Ashley Ellifritt, South Webster; Paige VanMeter, Southern; Caitlyn Holter, Southern; Jordan Taylor, Waterford; Bailey Offenberger, Waterford; Paige McCutcheon, Waterford.